For all those history buffs out there, take a quick break from the daily grind for a little historical perspective with the History Channel’s This Day in History site. A quick one-minute video will tell you some interesting factoids, or, if you’re really interested in a particular subject, the left-hand menu will get you to more extensive articles about Sports, Presidents, Disasters, Wars, and lots more. It’s a great site for reflecting and remembering on events that you lived through and learning more about events that you didn’t. Thanks to Marian Courtney for recommending the site! Join us outside the Library cafe this Wednesday at 3 p.m. for a lesson on the History and Making of Chocolate, including a rousing talk by Robert Weinberg of City Food Tours in Philadelphia. Stick around after the talk for a chocolate tasting. It’s a free event that’s bound to tickle any chocolate lover’s fancy…not to mention their taste buds! The library will once again be open 24/7 during finals week so that you have a place to study for that scary exam when your adrenaline is pumping at 2 a.m. the night (eer…morning) before. Back by popular demand, this service launched last spring and continued through the fall. We’re also offering a new service that will allow groups of two or more to reserve group study rooms between the hours of 9 a.m. and 9 p.m. during finals week. Be sure and coordinate with your group members – we need at least two names to call it a legitimate reservation. 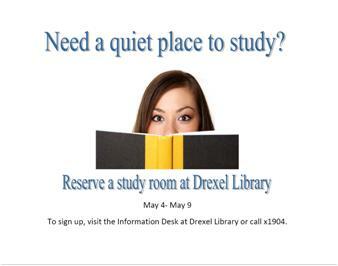 So if you’re meeting for a brainstorming session with classmates and want a nook all your own, sign up now by visiting the Information Desk, or calling 610.660.1904. Good luck with finals, and we’ll see you at the library!